Slip and fall injuries are more common and costly than most property owners believe. In fact, slip and fall accidents amounted to more than $10 billion in total costs for American businesses in 2010 (i). In another study, commercial property owners cited slip and fall accidents as the primary cause of most legal disputes faced annually (ii). Undeniably, property owners have much to gain by taking a proactive approach to accident prevention. There was a time when floor mats were thought to serve only as a protective layer for expensive flooring, like granite, tile, or hardwood. Today, that misconception is long gone. We live in a litigious society, and property owners learned long ago that commercial safety mats can go a long way in keeping entryways clean, dry, and safe. For best results, property owners are to pair an outdoor mat with a second indoor mat to ensure maximum debris containment. Outside, a weatherproof “scraper mat” with tough ridges and grooves will dislodge big dirt and debris from shoes. Inside, a wider and longer carpet met will serve as a “wiper,” giving guests a large area to wipe dry while entering the building. Some areas are more dangerous than others. For these areas, property owners might find it beneficial to proactively place caution signs by curbs, uneven floor transitions, abrupt drop-offs, and other disruptions in walking surface that might not be noticeable by first time guests. By law, property owners are required to disclose information on known dangerous. Failure to do so might be construed as negligence, in which property owners could be liable for accidents that occur. Slip and fall caution signs help property owners avoid this common pitfall, helping to notify guests of known dangers and risks. Guests are likely to slip, trip, or fall over 100% of the hazards they cannot see. Exceptional lighting is vital, especially at dusk. Exterior floodlights, entryway lights, and the overhead lighting throughout the facility are just 3 areas to be mindful. Safety mats, caution signs, and exceptional lighting mean little if they are not properly maintained. Unlike the property owners and/or business management, maintenance personnel are on the frontlines where accidents are most likely to occur. They see debris accumulation, liquid spills, burned-out lights, and other serious hazards long before anyone else. Moreover, they have the tools and knowledge to fix the problem before it has the chance to cause someone serious harm. Aside form debris, liquid accumulation is one of the biggest causes of slip and fall accidents. Liquid accumulation is particularly hard to manage on rainy days. Rainstorms have a tendency to cause hazardous puddles and slippery conditions at entryways, even when floor mats, safety signs, lights, and vigilant maintenance personnel are present. Wet umbrella bag stands give guests a place to store and secure their umbrella, significantly reducing the rainwater and mess they carry past the entryway. 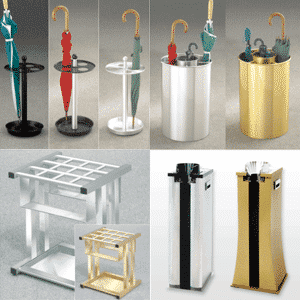 Wet umbrella bag stands are available in a variety of different sizes, finishes, and styles to complement most interior décor. When paired with mats and other safety products, umbrella bag stands are the final touch to an effective slip and fall prevention plan. (i) “Workplace Safety Index 2010.” Liberty Mutual Research Institute for Safety. (ii) “New Techniques for Slip and Fall Management.” CNA. Download the PDF. Wet umbrella bag stands are a hot commodity in the hospitality and high-end retail industries because they solve a specific problem with style and simplicity. Before umbrella bag stands became popular, rainy days were synonymous with slick entryways and unsightly dirt and mud accumulation. Worst of all, guests were tasked with carrying wet umbrellas while shopping or exploring the property. For high-end brands and exclusive destinations, such a chore has a subtle yet significantly negative impact on brand image and experience. Today, umbrella bag stands solve these problems simply by enabling the guest to wrap their wet umbrella upon entering the property. No mess. No hassle. The next generation of umbrella bag stands is here, feature automatic wrapping mechanisms to more easily and efficiently bag guests’ umbrellas. Despite sharp aesthetics and a novel design, property owners often ask: Why choose an automatic wet umbrella wrapper over a traditional umbrella stand, can, or rack? First and most obvious is the benefit of high-end style that automatic wet umbrella wrappers add to entryways. Umbrella bags are encased within the unit, preserving interior decor while minimizing design disruption. The automatic wrapping feature is an exceptional touch that adds to the customer experience, showing guests that the establishment innovation, service, and safety as top priorities. Property owners might be liable for lost, stolen, or mislaid items. For this reason, enabling guests to neatly wrap and carry their umbrellas helps to alleviate the risk of becoming liable for an umbrella that is left behind, misplaced, or reported stolen. High-end property owners understand that some guests demand a particular quality of experience when shopping or vacationing. Auto-wrappers preserve the highest quality of service by eliminating the nuisance created by wet umbrellas, without asking guests to leave them behind to dry. To learn more about automatic wet umbrella wrappers, call Umbrella Bagger at 1-855-328-8100. Property owners can sometimes be responsible for items left behind by their guests. For businesses in wet and tropical climates, those items are usually wet or broken umbrellas. By law, the manner in which the item is left behind determines the extent to which the property owner is responsible, or liable, for that item. The 3 main scenarios that occur often involve mislaid, lost, or abandoned property (discussed below). As a property owner, there are a few ways in which liability can be managed so as to prevent financial loss, unhappy guests, and a tarnished public image. First, property owners must make sure all employees and facility managers understand how mislaid, lost, and abandoned umbrellas are different. Then, a strategy must be created to handle each scenario properly. Was the Umbrella Mislaid or Lost? Lost property include items that are placed somewhere, and the owner forgets where he or she placed it. To avoid the pitfalls of mislaid or lost property, it is a good idea for property owners to encourage guests to always maintain possession of their belongs. Wet umbrellas present a unique challenge, however, because they can leave a trail of water that forms dangerous puddles through entryways, in elevator lobbies, and down hallways. Wet umbrella bag dispensers are an ideal solution, giving guests the ability to neatly wrap, stow, and maintain control of their wet umbrellas safely. In a special press release sent to New York and South Florida businesses and property owners, Umbrella Bagger announced the arrival of new automatic umbrella wrapping units designed to keep commercial facilities clean, dry, and safe. The new units are available in single dispenser and double dispenser models, providing two unique solutions for facilities with varying degrees of visitor traffic. A new spin on an old best-seller. The new auto-wrapping units are a new spin on an old favorite: the Wet Umbrella Bag Stand. Whereas the original simply presented hanging bags to guests, newer auto-wrapping units keep the bags neatly housed within the dispenser, inviting guests to insert a wet umbrella to have it conveniently wrapped. The new auto-wrappers are quickly becoming a favorite among New York and South Florida businesses. Though on opposite ends of the Atlantic Seaboard, New York and South Florida cities have a common safety concern: Rain. Rainy days present a real problem for property owners. Water accumulation, indoor puddles, and slip incidence all increase as storms worsen. Along with commercial matting, wet umbrella bag dispensers are an effective way to protect guests from slip and fall accidents. These units provide guests with a plastic bag in which wet umbrellas are placed, thereby reducing umbrella-related water accumulation in entryways, across lobby floors, and within elevator lobbies. Umbrella Bagger announces the arrival of new auto-wrapping units, the easiest and most convenient way for guests to bag and stow wet umbrellas on rainy days. 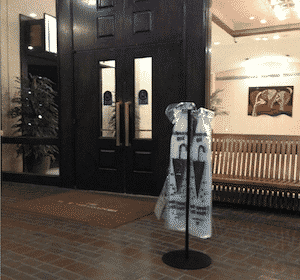 After inserting the umbrella into the wrapping unit, it is quickly bagged in a single fluid motion. The units serve a large number of guests with greater efficiency because of their auto-wrapping mechanism, making them a favorite among facilities in wet climates that experience a great degree of visitor traffic and turnover. 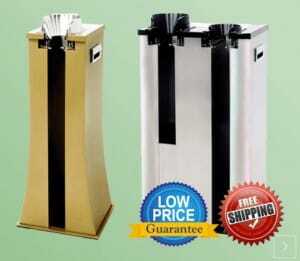 Shop wet umbrella bag stands online at Umbrellabagger.com, and receive free shipping and a 100% Price Match Guarantee on all online orders! Ensuring tenant safety in condos, apartments, and other residential buildings. The discussion of apartment safety often takes a back seat to discussions on commercial safety, perhaps because visitor turnover and increased exposure to weather makes commercial spaces ripe with dangers for guests. Nevertheless, developers and property owners are wise to consider tenant safety when conceptualizing, building, and managing residential living spaces. Pictured left is a wet umbrella bag stand positioned outside the Four Ambassadors Hotel and Residences in Miami, Florida. Refer to this image as you read the rest of this article, and consider how these simple products speak volumes about a building’s commitment to providing superior comfort and safety for guests. Why care about tenant safety? It’s projected that about 5 to 6 million families will become renters by 2013, according to statistics gathered by the National Association of Realtors. Some point to the mortgage crisis of 2008 as a main cause for this increasing population of renters. The lackluster recovery of the U.S. economy might likewise be keeping people renting, as fewer Americans have the liquidity to afford purchasing a new home. As the population of renters continues to climb, the concern for tenant safety will likewise become an increasingly important issue for property owners. Last month, our editorial team ranked residential apartment complexes as 1 of the top 5 places that benefit from wet umbrella wrappers. From property owners from liability to enhancing tenant living experience, here are the top 3 reasons property owners should make the cost effective leap toward safer entryways with these unique products. 1. Prevent liability for slip and fall accidents. By law, property owners have the legal responsibility to keep premises safe for visitors. They must also take reasonable action to repair unsafe conditions, and they must warn guests of known dangers. A slick floor surface that becomes slippery and dangerous when wet can sometimes constitute a known danger. Additionally, failure to clean liquid accumulation may constitute negligence, which can ultimately make the property owner responsible for any injuries that result. To prevent liability, property owners must employ management teams, maintenance personnel, and safety products to keep things safe for all guests. Wet umbrella wrappers are a proactive and cost-effective way to do so, particularly during days of inclement weather. 2. Protect tenants from the development of mold and mildew. Umbrella wrappers do more than just prevent slip and fall accidents. In keeping precipitation under control, these products also prevent standing liquid accumulation and the formation of mold and mildew. This is particularly important to implement in clubhouses and other common areas for which proper cleaning and upkeep is the responsibility of the management team. 3. Improve the building’s image. Safety is not the only benefit offered by wet umbrella wrappers. True, these units keep puddles from causing slips, falls, and hazardous mold formation. But they add value in another less obvious way: They build community image. By providing automatic umbrella wrappers, property managers convey genuine concern for the well-being and comfort of their guests. Whether tenants, guests, or prospective renters, all can appreciate the kind and thoughtful gesture that these units display. To learn more about umbrella stands, dispensers, and automatic wrappers for residential buildings, readers are invited to contact Umbrella Bagger Customer Services at 855-328-8100. How to protect employees and visitors during the busiest shopping days of the year. By mid-afternoon of Black Friday 2008, media outlets nationwide reported the same heartbreaking story: An elderly employee of a mega-retailer had been trampled to death by a mob of unruly shoppers. Since that time, retailers have committed to improving safety for both employees and shoppers during the busy sales events of the winter holiday season. The following Black Friday Safety Checklist draws vital information from Federal safety agencies and is intended to help storefront owners effectively manage crowds of customers. With a bit of proactive preparation, retailers can take positive steps to ensure the tragic events of Friday, November 28th are never repeated. The U.S. Occupational Safety and Health Administration (OSHA) published an online reference for all retailers to provide tips for preventing in-store accidents and injuries during busy sales events. Effective crowd management, according to OSHA, is critical in preventing accidents and fatal injuries. 1. Examine all major points of entry. Determine where the largest inflow and outflow of shoppers will occur, and station additional employees or security personnel as needed. 2. Verify the property’s compliance with all safety codes and requirements. This is most efficiently done by contacting local fire, police, and other municipality authorities. 3. To improve emergency response, designate one specific employee per shift to be responsible for contacting the police, EMTs, or the fire department in the case of an emergency. 1. Use posts, stanchions, and crowd control devices to create queues that will control the crowd as they enter the store. Create similar crowd control systems to sort shoppers into lines so they may make their purchase and exit the premises quickly and efficiently. 2. Designate employees to serve as Greeters, directing the public to specific line queues and/or points of entry as they arrive to the store. 3. Inside, display special sale items in a designated area that is easily accessible and clearly marked. This will reduce overcrowding in certain areas, and it will help shoppers find popular items quickly. 1. Designate a special entrance area for employees so personnel can enter and leave the premises freely. Station security personnel at the employee entrance to prevent public use. 2. Position uniformed security personnel at all points of major entry. Staff additional police, if needed. Positioning these trained professionals in highly visible areas will both discourage aggression among shoppers while also promoting feelings of safety. 3. Carefully monitor customer inflow, and do not let additional shoppers enter the premises after maximum occupancy is reached. The items above are just a small sample of a much larger report that OSHA has produced to help retailers control crowds and maintain safety during sales events this year. For the full report, including additional tips on responding to emergency situations, visit the complete Crowd Management Safety Guidelines for Retailers. Umbrella Bagger stands committed to helping retailers create a safe shopping experience this holiday season. In addition to following OSHA recommendations for effective crowd management, retailers are invited to learn more about slip and fall prevention with wet umbrella bag stands. Proactively prevent rain and snow puddles to keep entryways clean, dry, and safe through major sales events and days of inclement weather. To learn more, call Umbrella Bagger Client Services at 855-328-8100.